Southern senior Shelbi Dailey (15) drives a ball to right field during the Lady Tornadoes’ Division IV district semifinal softball game against Notre Dame on Thursday in Rio Grande, Ohio. RIO GRANDE, Ohio — The Division IV district semifinal softball game between Southern and Portsmouth Notre Dame at the University of Rio Grande on Thursday night was postponed due to darkness. The Lady Tornadoes currently trail the Lady Titans by a 5-0 count in the bottom of the fifth, and PND has runners on first and third with out in the frame. The game will be continued where it stopped at 4:30 p.m. Friday afternoon. 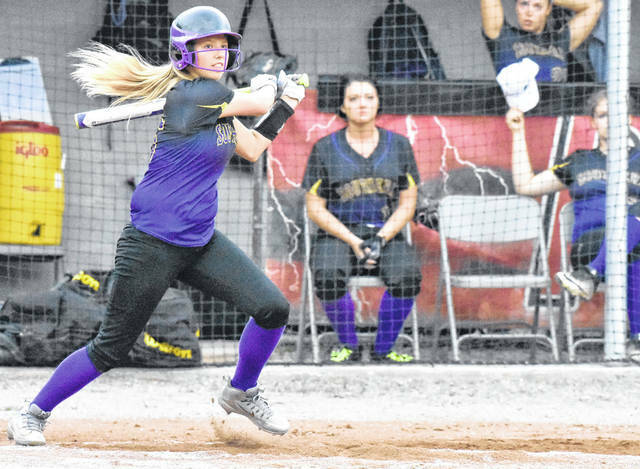 The winner will face Lucasville Valley in the district final after the Lady Indians defeated top-seeded Eastern by a 7-5 count in 15 innings in the first district semifinal Thursday. https://www.mydailytribune.com/wp-content/uploads/sites/42/2018/05/web1_5.17-SHS-Dailey.jpgSouthern senior Shelbi Dailey (15) drives a ball to right field during the Lady Tornadoes’ Division IV district semifinal softball game against Notre Dame on Thursday in Rio Grande, Ohio.